Some of my favorite comments from readers regarding the John Pickett mystery series concern the father-son relationship of Pickett and his magistrate, and how much the reader enjoys it. In fact, of the questions I’m asked most frequently about the series (aside from the obvious ones about if, when, and/or how Pickett and Lady Fieldhurst will ever get together), several concern the character of Pickett’s magistrate, Patrick Colquhoun. Readers want to know how his name is pronounced, and why I chose to give a character such a difficult name. To answer the first question, according to Debrett’s Correct Form, the name is pronounced “Ca-HOON,” at least in the United Kingdom. As for the second question, I chose it because Patrick Colquhoun was a real person, and a real magistrate at the time the books are set. And while I could find no evidence that he ever served in that capacity in Bow Street (in fact, my research sources place him at Queen Square), certain aspects of his life dovetail so nicely with that of John Pickett that I thought he would make a good mentor for my fictional Bow Street Runner. Patrick Colquhoun was born in Dumbarton, Scotland, on 14 March 1745 (making him 63 years old in 1808, where the John Pickett mysteries begin). He was orphaned at age 16, and traveled to the British colony of Virginia to seek his fortune. He returned to Scotland in 1766 and settled in Glasgow, going into business for himself in the linen trade. When war broke out in the colonies ten years later, he joined with thirteen other Glasgow businessmen in financing a local regiment, contributing £100 of his personal funds to fight the colonists—possibly one of the few bad business decisions he ever made. In 1775, at age 30, he married Janet Colquhoun, a distant cousin. They had seven children, but only four—one son and three daughters—lived to adulthood. 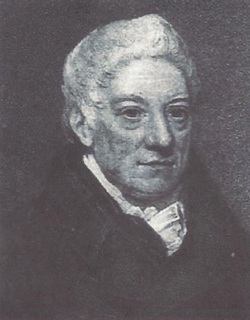 Patrick Colquhoun was a keen collector of statistics as well as a prolific writer, first on economic issues and later on topics relating to crime. His economic activities in Scotland—he formed the Glasgow Chamber of Commerce and Manufactures, and served as its first chairman—brought him into contact with political circles, into which he was soon throwing his considerable energy. He moved his family to London in November 1789, and was appointed as a Police Magistrate in 1792. His first reform efforts involved trade on the River Thames, where an estimated half-million pounds worth of cargo was stolen every year. Colquhoun made the shocking claim that fully one-third of the 33,000 river workers were known criminals who were in on the take—a claim which seemed to be confirmed when a mob attempted to burn down the office of the newly formed Thames River Police. The English people were suspicious of a standing police force, citing abuses by the police in France. By couching the debate in pragmatic terms, often as a matter of cost-benefit, he was able to allay many of these concerns, leading eventually to Robert Peel’s Metropolitan Police in 1829. Of Colquhoun’s many books and pamphlets, perhaps the most significant was his Treatise of the Police of the Metropolis, which emphasized the ineffectiveness of the old London “charlies” as a deterrent to crime. Patrick Colquhoun retired from his magistracy in 1818 and died two years later on 25 April 1820, at age 76. He is revered in England as a police reformer; in fact, the Metropolitan Marine Police—the modern incarnation of the Thames River Police—has a police boat named the Patrick Colquhoun. This entry was posted in History, John Pickett Mysteries, London, Regency, Uncategorized. Bookmark the permalink. Interesting info–and thanks for telling us how to pronounce that name 🙂 It’s also great to discover (real) facts about our characters. Good job. Thanks for commenting, Barb! And like you, I had no idea how to pronounce that name until I looked it up! This is a fascinating article. I’m going to pick up one of your mysteries. Thanks for sharing. Website copyright © 2016 by Sheri Cobb South. All rights reserved. Website design by Web Crafters.